The Angerstein and Murphy's wharves. Illustration by David Fathers. If you are a regular Thames walker, you might think that interesting features eastwards beyond the O2 Arena are scant. There's the Greenwich Peninsula Ecology Park and the Thames Barrier, but more than that may be hard to spot — at first. Between the two, the crunch of gravel under foot and conveyor belts overhead are signs of a huge working import dock known collectively as the Angerstein and Murphy’s wharves. London was, until the 1960s, a massive industrial hub. Raw materials, often imported by ship, were used to manufacture a kaleidoscope of products from paint to pianos, ceramics to cars, and rugs to railway engines. Many of the finished goods were shipped out from the numerous ports of the capital to the UK and the world beyond. The advent of containerisation and the shallow waters of the Thames made it impossible for the new, larger ships and tankers to reach the Royal Docks, let alone the Pool of London. Much of the import-export handling now shifted downstream to Tilbury, in Essex and Harwich. The docks and wharves of London went into decline and closed down, then many of the riverside structures were either demolished or converted, becoming expensive apartments, shopping centres and high-rise offices. However, the Angerstein and Murphy’s wharves remain — though they are largely unheard of. 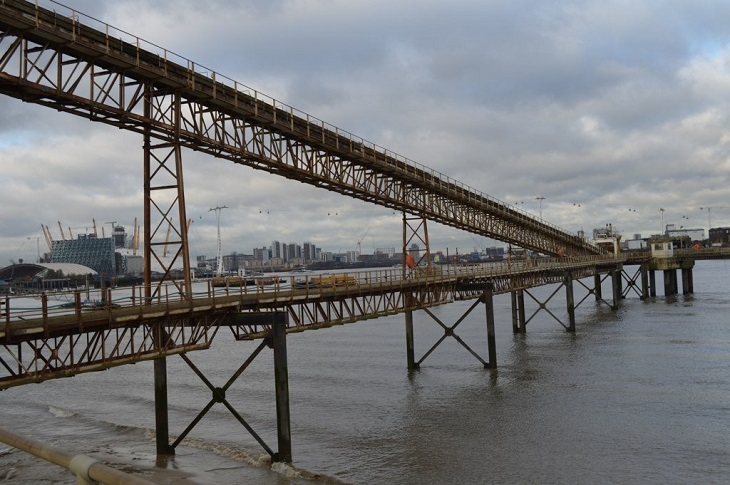 Established nearly 200 years ago by John Julius Angerstein, an art collector and entrepreneur, the 13 hectare site imports 2.5m tonnes of marine aggregates for road and construction usage in London and the rest of the UK. Specially-designed ships dredge licensed areas of sea beds around Britain for sand and gravel then, once at the dock, a series of scoops and conveyor belts extract the produce onshore, where it is graded. From the Thames Path you can see great pyramids of aggregates ready to be removed by truck or train. The Angerstein and Murphy’s wharves have their own dedicated private rail spur, which connects to the UK network. The area is well worth a visit.